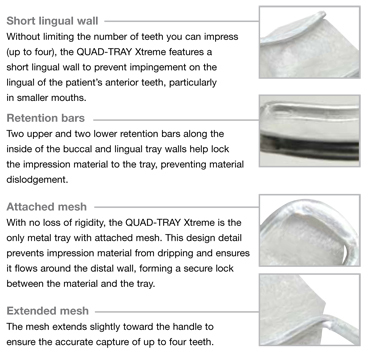 The QUAD-TRAY® Xtreme™ is dentistry’s best-selling, #1 rated, metal dual-arch, disposable impression tray. Thanks to many clinically significant features, it has been improving impression accuracy for dentists worldwide for almost 15 years. The Problem with Plastic Trays If your impression is poor, your crown or bridge will fit poorly, too. Most plastic trays are inadequately designed, incorporating features that make impression distortion common. For instance, due to their elastic nature, plastic dual-arch trays flex easily. What’s more, when a patient closes into the impression material, the plastic tray deforms and, upon removal of the impression, the tray’s elastic memory works against the impression material, again, often resulting in a distorted impression. The QUAD-TRAY Xtreme is made from rigid aluminum so it will not distort when placed intraorally or upon removal. 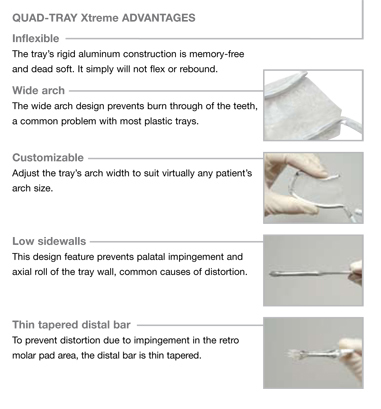 Considering the costs and time involved with taking an impression, seating it, then repeating the process because of a poor fit (add in additional lab fees, too), it makes sense to use the only tray designed and proven to consistently prevent distortion, and create predictably accurate, dual-arch impressions – the QUAD-TRAY Xtreme. Click the button below to add the Quad Tray Xtreme to your wish list.